Fusion Teas was founded in 2010 and is run by Thomas and Theann Egbert in McKinney, Texas. The Egbert family is focused on spreading health and happiness through high quality teas and products and making loose leaf tea accessible – a healthy habit and something you reach for every day. Thomas and Theann’s love of tea began when they fell in love with Yerba Maté after learning about its health benefits. They rapidly expanded their cupboard collection of herbal infusions to include hibiscus and other caffeine-free herbs, but saw that most tea companies lack in truly flavorful, unique blends. After sharing their favorites with friends and seeing how much other people love teas that go beyond plain chamomile or basic lemon green tea, they decided to launch their own tea business focused on bold, innovative blends (hence, ‘Fusion’) with a handful of quality pure teas. They curated a selection of some of the world’s best herbal teas and herbal tea blends, with a spotlight on hibiscus and yerba maté blends, and over the years have kept adding to the collection to include pure teas as well as premium, Organic Certified and Fair Trade teas. Their business thrives on personal connection and when they are not at their local shop the Egbert family is out at local markets like McKinney’s Third Monday Trade Days. They love meeting customers and converting new tea drinkers. “It’s a great way for us to learn what our customers like, so we can adjust what we offer and make sure we continue to surprise and delight them,” says Thomas Egbert. Over the years, Fusion has built a loyal social media following, with over 3,000 Facebook fans and over 1,000 followers on both Instagram and Twitter. Their blog is updated several times a week receives on average 4,000-5,000 visitors a month. “At Fusion Teas, we’re not stuck in ideas of what tea ‘should’ be like or what the newest ‘beverage trend’ is this week. Our focus is solely on teas that charm, delight and leave you feeling happy and healthy,” says Thomas. 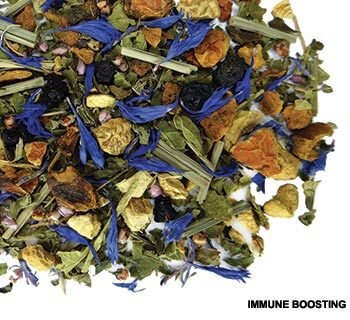 Fusion’s teas are made with only the finest ingredients. Over the years, they have formulated custom blends with a master blender for maximum flavor and delight. Rich, bold, dark, intense: black tea is, by far, the most popular tea in the Western world. It’s also one of the easiest teas to brew. From our pure teas, we suggest our English Breakfast and Makaibari 1st Flush Darjeeling. Some our favorites from our flavored tea collection are Premium Earl Grey, Ginger Peach, Masala Chai, and Passion Fruit. This antioxidant powerhouse is as delicious as it is healthy. From our pure green teas, we suggest Mao Feng and Matcha. From the flavored collection, Apple Ginger, Green Walnut, Pink Earl Grey, Super Fruit Sencha and Jasmine. Sweet, nuanced, sophisticated - oolong tea is the ideal connoisseur’s tea, yet it appeals to many tea newbies, too. If you usually drink soda, juice and other sweet beverages, then we recommend starting off with one of our flavored oolongs like Very Velvet and Coconut Pouchong. Monkey Picked is a great choice if you’re looking for a pure oolong. Known for their low caffeine levels and high antioxidant levels, we recommend ethereal Peach Fuzz White Tea and Exotic Pomegranate White Tea from our flavored collection for those who like fruity teas. For the purists, we recommend Bai Mu Dan. Herbal tea can be both soothing and invigorating, grounding and uplifting all at once. It’s one of the most versatile groups of tea. Our most popular blended herbal tea is Chamomile Vanilla Bean Herbal. Our fresh, minty Holy Detox Tulsi Tea is great to help reset the body with a detox. We also love Orange Grapefruit and Strawberry Ginger. Yerba mate is referred to as “the drink of the gods” in South America, and with good reason. This delicious beverage provides a caffeine kick without the jitters, making it a favorite for recovering coffee addicts and those burning the midnight oil. We recommend Extreme Mango, Roasted Cocoa, Good Morning and Very Berry Guayusa. Bold, tart and so full of flavor! Hibiscus is a longtime favorite in Jamaica and much of the Caribbean, and it's gaining favor all around the world as a natural way to promote heart health. At Fusion Teas, it's a best seller. We love the incredible, cranberry-like flavor that hibiscus has to offer, both pure and in fruity or spiced blends. Not only do we sell tea but also delicious fermented drinks: kombucha and kefir (which has a fantastically tangy flavor that we just adore). We are proud to offer two ferment starters—kombucha SCOBYs and kefir grains. Each SCOBY order includes instructions for making your own kombucha at home, while each kefir grains order includes an e-book on DIY kefir and we’re happy to answer any questions! We guarantee they will arrive safe and ready to perform or we will replace them. Teaware doesn’t have to cost a fortune, be kept away from the kids or require a PhD to use. Fusion’s teaware is selected for its sturdiness, functionality and ability to withstand all life has to throw at it. Modern styles remind Fusion tea drinkers that this is not your grandma’s tea! If you’re interested in learning more about us or our teas, we’d love to hear from you!